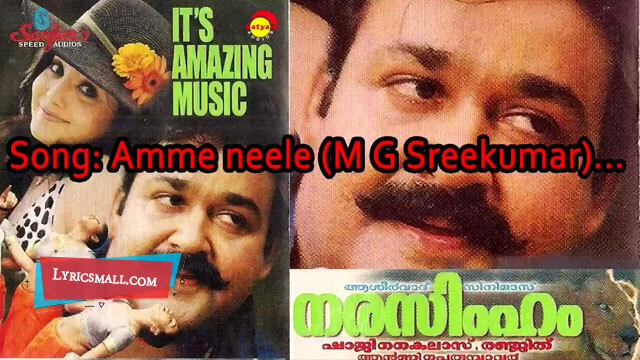 Amme Nile Lyrics from Narasimham Malayalam Movie. Directed by Shaji Kailas. Produced by Antony Perumbavoor under the banner Aashirvad Cinemas. Starring Mohanlal, Thilakan, N. F. Varghese, Aishwarya, Jagathy Sreekumar, Kanaka, Sai Kumar. Music composed by M. G. Radhakrishnan. Lyrics were written by Gireesh Puthenchery. Sung by MG Sreekumar.